Cancer jargon is sometimes lost in translation. I admit it, I’m still an infant in the world of cancer. Coming up on two-and-a-half years since my male breast cancer diagnosis, surgery and recovery, I’m often confused by the infinite procedures and programs that cancer survivors undergo. In fact he began to sound to me like a better version of Dr. Oz of television fame. I wondered if he had his own show? 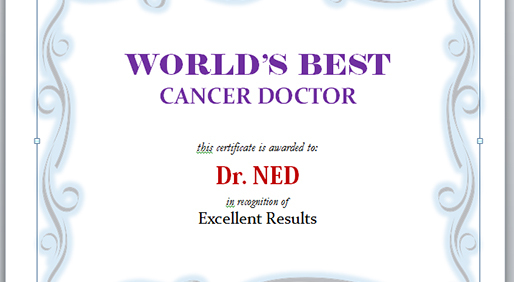 And then of course the truth revealed itself when some happy breast cancer friend of mine expressed her great joy at having been awarded the title “No Evidence of Disease” or “NED” after her checkup. Suddenly Ned, though no less a celebrity in my eyes, was nothing more than an acronym –and a darned good one at that. Interestingly, when I was in the second grade, our teacher would have us put our heads down on our desks and listen to a 15-minute musical radio broadcast with singing by a wonderful choir out of Utah. Every week they would announce the “Norman Tabernacle Choir” and it wasn’t until some months later that I realized this guy call “Norman” was nonexistent. At that age I had no concept of the word “Mormon” and so the next logical step for a kid was to fill in the blanks with the information available to me. As adults we often do that also. How easy it is to misinterpret elements of our lives based on our assumptions. Cancer is like that. Who can’t remember a time as cancer patients when we sat with a surgeon or oncologist and listened to vast amounts of what sounded like gibberish—at least to our untrained and sometimes overstressed ears? Think back to when you first heard those words that are spoken fourteen million times a year around the world, “you have cancer.” How much of the continuing conversation do you recall after hearing that? Sometimes a disease, side effects, medication, procedure, therapy or test result can sound like a foreign language. And that’s all the more reason to ask lots of questions as we move forward with our efforts to outlive cancer. The human brain is the most complex processor of information on the planet. Our ability to store and utilize information is in large part what makes us human. A study conducted by researchers at the University of California in San Diego concluded that people are inundated every day with the equivalent amount of 34 gigabytes of information, a sufficient quantity to overload a laptop computer within a week. So it’s important to retain all that is pertinent to our health and healing – a task that is certainly not easy considering the often contradictory and confusing streams of information that we receive about our particular cancer. It all boils down to listening and questioning. If your doctor suggests something to you that is not entirely clear, request a thorough explanation. We often experience an urgency of sorts in medical settings, either because we are uncomfortable with the proceedings or we are concerned that we are taking too much time with our health provider. Both assumptions are counterproductive. Insist on a full understanding of what’s been discussed before leaving the office. This is your right and your responsibility as a cancer survivor. It’s easy for any professional to assume that we understand what they’re telling us, since their knowledge has been shared and repeated to countless patients. But it’s up to us to become the “interviewers” in that scenario, asking the pertinent questions that directly affect our health and wellbeing. In doing that we greatly increase our odds of meeting “Dr. Ned” once and for all.